Cyberspace- Talk about March Madness!! 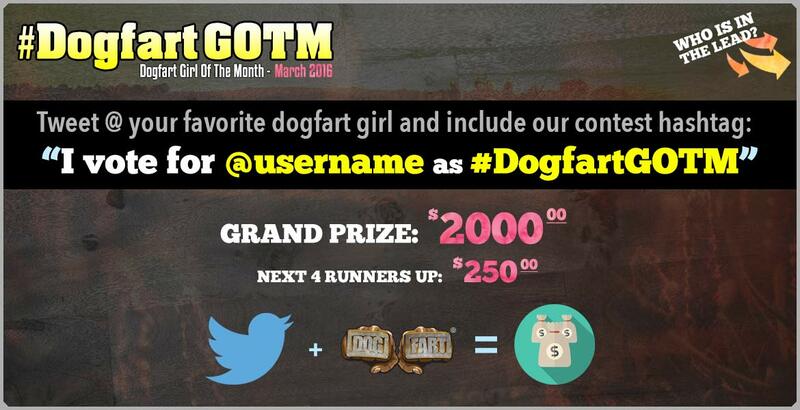 This month’s Dogfart Girl of the Month contest will literally come down to the wire! Only 30 votes separate Lexi and Kate from the top spot and this month’s contest has seen more votes than ever before! Fans can tweet their vote up until 11:59 pm Thursday, so make sure you vote for your favorite Dogfart girl. All you have to do is tweet “I Vote (@Username) for #DogfartGOTM.” The winner gets a cool 2Gs and the next 4 performers with the highest votes will win $250.00 each. 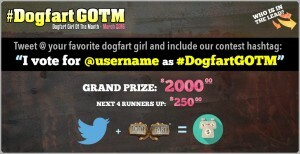 To view the current Dogfart Girl Of The Month standings click here. Wanna see more from the Dogfart network? Check out DogfartNetwork.com. This entry was posted in Press Releases and tagged Dogfart on March 31, 2016 by TPNadmin.